I can’t think of a time in recent memory that I have had less fun than I did on Easter Sunday. It was the day I found out that feeding four young children a breakfast of donuts and Easter basket candy results in the same behavior you’d expect to see if you gave crack to monkeys. It was the day that I learned that my husband and I are evidently descended entirely from warlike peoples, our genes leaving our offspring without a shred of proclivity towards civilized behavior or docility. It was a day that I was blessed with bountiful opportunities to work on the sins of pride, wrath and despair, all within the span of an hour. It started out nicely enough. My mom had bought a new suit for my five-year-old son, and identical teal floral dresses for my three daughters, all ages three and under. After going through the process of wrestling the sugar-manic kids into their fancy clothes and finding matching socks and dress shoes for each one of them, we actually managed to get out the door in time to arrive at church a little early. We got a seat in a pew towards the front, and my two toddler girls immediately started getting fussy. It was an ominous sign, considering that Mass wouldn’t start for ten minutes. On top of their breakfast devoid of a single nourishing molecule, they hadn’t slept well the night before. I looked over and saw my three-year-old daughter enact the universal sign for “YOUR ENTIRE DAY IS ABOUT TO BE AN EPIC FAIL” by lashing out in frustration and then rubbing her eyes. She was cranky. It was because she was losing control from being overtired. This was going to be bad. The choir started belting out a joyous hymn, and the entrance procession began, a deacon holding up a large gold-plated Bible as he walked down the center aisle. Everyone stood, the traditional Christian posture indicating readiness to hear and respond to the Word of God. Everyone except for my two toddler daughters, that is, who threw themselves on the floor when I asked them to stand. Their behavior got worse and worse, and after a few minutes I left my husband with my son and the baby so that I could take the two girls to the “cry room, ” a glass-walled soundproof room within the sanctuary. I nodded hello to some parents I recognized from Mother’s Day Out, whose children were coloring quietly in their seats. I settled us into some chairs at the front. “Should be fine from here, ” I thought fatefully. At least their whining, harrumphing, and occasional shouts of “no!” whenever I so much as looked at them wouldn’t disturb the congregation. We made it through the first two Scripture readings, and I even managed to get the girls to sing along with the Psalm. Then it was time for the Gospel — and not just any Gospel reading, but the account of the glorious Resurrection that we were there to celebrate! We all stood, and I traced the sign of the Cross over my forehead, lips and heart, in the traditional sign of desire that Christ’s words might be on my mind, on my lips, and in my heart. I was ready to enter into the mysteries of the Word. I closed my eyes. Speak, Lord, for your servant is listening. I opened my eyes just in time to see a flash of teal as my two-year-old daughter football-tackled her sister, the two of them rolling across the floor like a pastel-colored, screaming boulder. Hair was pulled, shoes were kicked off, and the shrieking was enough to shatter an eardrum. If the other people in the cry room could have heard me, I would have shouted over the noise to explain that I found these two feral children living in the woods behind the church — in, umm, matching designer dresses — and took pity on them and brought them in. Instead I just dragged the girls outside, attracting the full attention of the thousand or so people in attendance when the girls’ screams filled the sanctuary in the time it took me to get from the cry room to the exit. It took about fifteen minutes to get them calmed down. By the time I returned to the cry room I’d missed the Gospel and most of the priest’s homily. The rest of the Mass was better, in the sense that it was the kind of day where only having to hiss “don’t lick the chair!” three times was a step up. We made it through the consecration, Communion and the final blessing; I even managed to keep my composure when one of my daughters asked me during the closing hymn what her “special church tweet” was going to be, referring to the goodies we sometimes give the kids after Mass when they behave well. When we got outside, the three of us looked like we’d been through some sort of battle. My skirt was hanging lopsided from having it yanked on so many times. The girls were each missing a shoe, which I carried under my arm, and their bows dangled limply from their hair. “Wow, that was a catastrophe, ” my husband commented when he saw us. I realized as we walked back to the car that, oddly enough, I didn’t feel like it was a complete failure. I was puzzled by my own reaction that I felt like it was actually a fulfilling experience. I thought back through the Kafkaesque memory reel of the preceding hour, and I think it was then that I understood the wisdom and beauty of the Eucharist more than I ever had before. When I was first researching Christianity I read some of the writings of the early Christians, and felt like I had stumbled across a very odd religion here. They all seemed to see their church services as revolving around Communion, and they seemed to think that this Eucharist, the bread they ate at Mass, was, literally, the body of God incarnate. My initial reaction to this stuff was to get all John 6:60 about it. It was a hard teaching. After enough reading, I eventually came to an intellectual acceptance of the idea of God’s own flesh being made present at the Mass, though I still felt somewhat puzzled by why God would do something so outlandish and why it was necessary in the first place. Over the past few years, though, something changed. 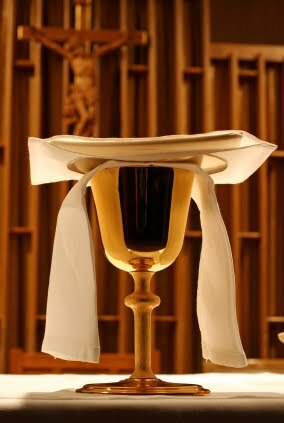 As I’ve said before, the more I received the Eucharist, the more I understood in both my mind and my heart that this is indeed life-giving food for the soul. I’ve come to see the genius of God giving himself to us in such a primal way, and what an unfathomable gift it is that he strengthens us with his own physical being. And it has never been more clear than on Easter Sunday. Church that day was more about survival than enjoyment, with 100% of my brain power and emotional energy going to wishing that straight jackets came in sizes 2 and 3T. I wasn’t able to even hear the Word, let alone think about it, and any deep contemplation of the Resurrection was out of the question. And yet when the priest placed the Eucharist on my tongue, I received Jesus Christ himself — who is the Word and who is the Resurrection. As I walked away from the church building, disheveled and frazzled, I smiled when I thought back on my very un-fun morning at Mass. I was overwhelmed with relief to realize that I didn’t need to be able to feel happy emotions at church (or even be able to think much at all), and still I’d receive everything I could ever want or need. With six fairly young kids, I don't often experience a quiet, meditative Mass. It is always full of distractions, and I had to laugh at your post, remembering the time I left my boys in the pew of a tiny church as I went up for Communion. I rose from the Communion rail to return to the pew, and they were pounding one another in the pew. Yes. Thank you so much; I can wholly relate, and you told it beautifully. I agree, it took me a while to figure out what the big deal about the Eucharist was, even once I had intellectually accepted it – but now I love it! It may or may not help you to know that we've all been there. Please consider, though, that on Easter you enacted your own, personal Passion Play. Did you think, as you came in church, about denying your little ones the blessings of the mass by placing them in the nursery, so that you could concentrate better? This was your Gethsemene. Like the Lord, you chose the cross, not a physical cross, but the cross of humiliation none the less. For all of us who have done it know what its like to have to drag a screaming child out of church. And then to die to self by spending the gospel and homily outside polishing little souls instead of inside having your own soul blessed. But, because you had endured your cross and shame, you experienced the glorious Resurrection of eternal life as you received the precious Eucharist. Thus, in "choos[ing] the cross, despising not the shame" you brought not just yourself but you precious family a little closer to salvation. And had the amazing courage to bless those of us who remember those days with a good laugh, for which we are very grateful. Wow, that sounds familiar. I remember an Easter Sunday Mass much like that a couple years ago with my two boys when they were both under two. I was happy that there were six more Sundays in which to celebrate the Resurrection. Surely at least one of those would feel joyful! However, it was good to be reminded by you that we can have a fulfilling Mass experience even without feeling anything . "I didn't need to be able to feel happy emotions at church (or even be able to think much at all), and still I'd receive everything I could ever want or need." going through a hard season at church, this was exactly what God needed to tell me this morning. thank-you for being his voice to me today. Have a wonderful Monday! My mom says that when we were kids there were many Masses that they didn't get much out of. I remember this almost weekly. Although then I have to coutner it by reminding myself that it's not permission to Not Pay Attention. I find that the key to worshiping with children who have the gall to act their age is to keep a sense of humor about the whole thing, and to remember that God does too. Most congregants are probably smiling to themselves, remembering (or anticipating) those days, and as for the few who might throw dirty looks, well, they just need prayers so they can develop a sense of holy humor too. Jen, Easter candy and donuts? At least you know why they were so unruly. This was seriously one of the best posts I've read in a long time. Thank you so so much . I wish I could have read this when my five were younger and I looked at it so differently. We chose to stay home so many times. This , and Susan's comment , needs to be read by many families. Those with or without children. I hate it when people tell me that I should be feeling some emotion or another, I'm feeling what I'm feeling. I love that Catholicism allows to to be in God's presence without actually feeling his presence. I can come to him as I am, no matter what I am; sad, happily distracted, hurt, or joyful, and He's there. He accepts what I'm able to give as a broken child of his, feeds me and heals me so that I can give more. One thing that I have learned in the past month is that separation helps a lot. For instance, the farther I can keep my two oldest daughters (7) and (4) away from each other in the pew the smoother Mass will go. Although, my almost two-year-old is starting to make things really interesting, and it should be really interesting when #4 arrives in June. We totally avoid Saturday evening Mass because it pretty much insures that Mass will be about survival and nothing else. So, in other words, I totally relate to your post. It is always just so heartbreaking when we cannot even make it to Communion but have to leave early because it's really that bad. Hey, at least we tried, I figure. This was great!! Although mine are getting older (my youngest is now 5), we still have trouble sitting still in Mass some days. I have a friend who went to confession some years ago and confessed to the priest about going to Mass and not being attentive because she was a so busy disciplining her 3 young boys. The priest's words of wisdom, which she shared with me, have always stuck with me through these "seasons" of young children. He told her that God had given her this vocation as a mother, and one of the most important parts of that vocation was to take our children to Mass and teach them about Christ and the gift He gave us in our faith and the sacraments. He went on to tell her that as she was being faithful to her vocation, God knew the intentions of her heart, and He also knew that she was doing her best to fulfill the vocation that came from Him. That always helps to remind me that God forgives me when I am in Mass and wrangling children rather than focusing my full attention on Him. I know what you mean!! And I wrote a while back about how this is one of the things I long for. "Luckily, the sanctity of the Sacrament is not affected by your ability to pay attention." Congratulations on NOT having the 5 year lag time I have on lessons taught by children at Mass. When my son was 4 he threw a spectacular tantrum, full body laid out on the pew, feet kicking reaction to being asked to stand up. This was with the nun/principal of our school in the pew behind us. Humiliations galore! But now a funny story to bring up in calm moments. You are an excellent writer, and I can't wait to buy your book. FWIW, I remember many masses like that when I had four children 5 and under in-tow. Now my oldest is 8, my next 6 and my daughter is 5. They are almost always well behaved — or at least tolerable to me, and quiet. This has made my current 3 yo the best behaved 3 yo in mass. He is well behaved because the kids around him are older. Just know, it gets better with age. And your mention of the cry room inhabitants touched a nerve: Every now and then I try to take a child into the cry room and find it entirely populated by whole families with their children quietly coloring or looking at books. Note to these parents: if your children can sit quietly, take 'em back in church and leave the cry room for those of us who really need it! I came to a HUGE revelation this weekend after talking with a friend about why I was struggling so much with my three boys under five and their chronic misbehavior–I was expecting days with NO SIN. lol! i just about cracked up at your description of the girls…it gave me a hearty guffaw…because i can oh so relate! i remember one Communion Sunday, it was SO very quiet while we waited to receive our bread and wine…and i was kneeling on the alter praying and suddenly my oldest daughter DEMANDED in the louded, most frustrated voice i had EVER heard in a church that her younger sisters SHUT UP! it wasn't "be quiet!" or "hush" but a flat out SHUT UP *insert italics AND bold*! and i mean, the organist about played the wrong notes that time lol, my baby was that loud. all i could do was wince in psychological pain at the crudeness of it all. i had to say an extra prayer for forgivness that Sunday lol. i know that God only requires our best…the rest is up to him. a year or so later, all three of my girls behave *basically* very well in church now, and have the greatest behavior on Communion Sundays. Oh Jen, thank you so much for this post! I have been struggling with this for the past few months, and even left my home church because our priest and several older parishioners made me feel extremely unwelcome due to my son's gall to act like a 2 year old (he just turned 2 in January). And he's actually well behaved for a toddler! I was told that I needed to keep him in the nursery or cry room, and my thought was "How on earth will a child learn to behave during Mass if he sits in the nursery or cry room and plays with toys for an hour?" and also "I might as well just not come, since I wouldn't get anything out of it either." And the noise that my son was making? He yells "AMEN" at the end of every prayer. It's good to know I'm not alone, and that others like you and your readers share my frustration and enthusiasm. I think the "cry room's" exit should lead outside for occasions such as this. I've been there! A few weeks ago in confession a priest gave me a great analogy for not being able to pay attention in mass. He likened it to a husband whose wife had prepared hundreds of meals for him over the years. Some of those meals were wonderful and were the best things he had ever tasted. Some of them were not so good and he really could have done without them. But most of the meals were somewhere in the middle, they were just what he needed, nourishment for his body. Anyway, I really got a lot from that analogy. Thanks for your post! I love this. I had a similar experience after a 2 hour Latin High Mass plus Benediction spent wrestling with my 2 year old and 5 month old in the hot cry room filled with cranky toddlers. How I managed to keep my joy and come out feeling better than I had felt in a long time despite this and not eating for 7 hours can only be attributed to Our Blessed Lord in the Eucharist. Thank you so much for this post! We spent a couple of years in the crying room too when my children were 5 and 2. Now that they are 9 and 6 they are definitely much better behaved. We still have some days when they poke each other, but the key for us is to separate them. Also, after we started homeschooling, they have learned so much about the mass and why we are there. Thank God for the gift of the Body, Blood, Soul and Divinity of Jesus. He is our food for the journey! Hang in there…it will get better as they get older. "now we're working on no nudging each other in church and kneeling upright without lazy bottoms on the pews." Lazy bottoms on the pews are inappropriate? It is unrealistic to expect toddlers to sit through a mass. Your post was amusing and insightful, and I don't mean to slight the main point, which was that mass was fulfilling for you, even if it was not a quiet, mindful, meditative experience. However, I see a lot of parents of young children wasting a great deal of time and energy trying to get two year olds to act like ten year olds. My advice would be to plan for survival every mass. One way is to use the cry room whenever your kids are crying. There is absolutely no reason to take them out, and please do not keep them in the sanctuary with the misguided idea that they have to "learn" to behave. Another thing you should do is bring books or small toys to keep them occupied. A one hour catholic mass is not a kid-friendly activity. Don't set yourself up for failure by expecting them to "pay attention." Our rule has always been that our son could bring a book or something to draw or color with, but no electronic toys. As he has grown older, he has slowly taken more of an interest in the mass–but it really is geared toward adults. The last thing you must do is give up on "paying attention" or having a fulfilling spiritual experience in mass. If you want to do that, leave the kids with your husband and go alone. As long as you have very small children, your main job will be tending to them, often in the cry room, until they are old enough to behave reasonably well. It does get better. By the way, there is nothing wrong with putting them in the nursery. Get real, people. I laughed so hard reading this. I've spent many a Mass wandering around outside, in all kinds of weather. We don't have a cry room, and though my priest (God bless him) has said I'll never hear him complain about kids ( and it's true) sometimes you've got to take the old yellers out of there. Just remember two things: 1) we're both body and soul, and there's a reason God chose such a physical way to get close to us, a way that doesn't always require our close attention, and 2) BACON BACON BACON–it is the key to counteracting the vicious donut-candy meltdown (the fat and protein provide ballast to all that sugar, sugar which is completely unavoidable). These days, right after praying, "Oh Lord, I am not worthy…" I have to breathe the prayer, "You know how distracted and frazzled I am right now, please accept my heart as it is!" Your post reminded me that He feeds us, no matter how frazzled (read: humiliated) we are at the moment we receive Him! Oh, brother! I haven't laughed this hard in a long time! Really, what mother of toddlers didn't wish for at least one set of 2T straight jackets! !Thank you, Jennifer for putting into words what I have experienced myself. There have been so many masses that I have wondered "really, what's the point" yet, continue to attend with 6 kids in tow, always hoping for the best. Susan and Kris, thank you for adding to the sentiments. It reminds me of the time that my then 3 yr. old daughter refused to get up and walk down the aisle for the Eucharist. I was holding her infant brother, otherwise I could have scooped her up. It's rare that a child gets the best of the situation at our house. But, being so surprised, and having only a split second to decide whether to leave her in the pew or not, uncharacteristically for me, I opted for the former. I couldn't describe the inexpicable draw to the Eucharist over my own offspring whom I was so deeply attached, and stepping over to get to my spiritual food, and would normally never dream of leaving. Both she and the adults in close proximity were stunned by my actions, and the gasps were audible. Needless to say, she never protested again. And my psychologist husband doesn't seem to think there is irreversible damage! 😉 However, all four of my little stairsteps have given me ample opportunity to practice humility, most recently this past Sunday when dd-3 leaned over and kissed my substantial rear-end! This time there were audible snickers! Anonymous, I'm somewhat confused by several of your points. Of course children should learn that they are expected to behave in Mass. And why should quiet children play in a cry room – they can do that at home – instead of sitting with their families before the tabernacle? I realize that every family has different methods, and that different things work for everyone. As children, my siblings and I were never permitted to bring toys into the church. We were told over and over, "This is time with Jesus," and that was that. Now, we weren't perfect angels – it took years for us to "get it together," of course – but it was all worth it. I thank my parents frequently for their consistency and good example in taking the entire family to Mass, no matter how we reacted! I loved this….it's why we our parents made us eat the hardboiled eggs first thing in the morning (of course, back then, the eggs had sat out all night, so there were other problems sometimes….!). People who wear size 2 and 3T ought not to be asked to stand or kneel pr expected to do anything but not talk loudly. They will do better if left alone while receiving lots of physical comfort contact. They will pick up on the atmosphere and calm down, but not if Mama and Daddy are uptight about behavior. One of your best columns, Jennifer! I don't have kids (God had other ideas apparently), but I'm often humbled to see the struggles that parents go through to get their kids ready for Mass, to teach them proper respect for the Mass, to corral them when they're antsy and shush them when they're whiny or crying or speaking "sotto voce" in a loud voice resounding. Moms and dads: you need to be commended. I don't know how you get anything much out of Mass, yet you continue to come so that your children will learn to value our Church. My heart went out to you when I read your experience. The story of the crucifixion and Easter is such a powerful depiction of denying the flesh and doing what's right regardless of the normal human response or feeling. That was what was so incredible about Jesus' example. Learning to follow Him in this way is excruciatingly hard and requires a lot of discipline (like it talks about in Matthew 16). To be his disciple necessitates the discipline of denying ourselves too… I hope you're able to teach your daughters this one day. James 5:1 says God knows how to give perfect wisdom where we lack it (I'd like to think that especially goes for understanding what's best for our children). You are thinking a great deal and desperately wanting what's right. I have no doubt the more you ask for God's wisdom, the more you'll find the answers for your two precious charges. They grow up so quickly. I so appreciate your heart, my friend. thought I was the only one, thank you so much for your honesty! We used to give our kids hard boiled Easter eggs for breakfast on Easter morning — and no candy until they got home! The protein in the eggs helped to ballast the carbs in the toast or cereal they might also eat. And Easter eggs were enough of a treat that they felt they were getting something special. I think it helped with the behavior. As for toys in church, or coloring books, we didn't allow it because it encourages the children to ignore the Mass. But we did allow religious picture books for children who were too small to read the missalette. And we tried to teach them the simpler responses at a young age because it gives them something to do and helps them to feel they are taking part in the liturgy. About those kids, Jen. They do grow up — and then we become either quite masochistic or quite senile because we want those childhood years BACK! Go figure! Oh, I do want (especially for the benefit of those Anonymice who think children should be in the nursery) to add that in the last few weeks George (2 in January) has actually started to pay attention at Mass and "copy" my husband and me. He tries his hardest to make the sign of the cross, and will kneel at the communion rail with his hands clasped (as he has not had 1st Communion yet, he receives a blessing). We also have been working on following directions and using the indoor voice (a little babbling is fine, small victories!). I attribute a huge amount of this success to working in prayers in our daily life, especially at bedtime, and also the very supportive atmosphere of our new parish. Of course, I take him to Children's Chapel during the first part of the service (readings, sermon) and we rejoin the congregation at the offertory. In CC the children learn to kneel, pray, and show respect for the altar. I am grateful that you shared such a wonderful, heart-opening experience. I knew there was something I was supposed to learn from the service, even when I can’t remember a word of it for chasing my 2 year old. You said, humility! Services aren’t our only responsibility–there are those little blessings sitting in the pew beside us who need to know what the service is, too. The stares from others when our children aren’t quiet or still, whether real or imagined, help humble us, and that might be the real blessing!